Cormac McCarthy’s No Country For Old Men is not a novel that rears its brutal head amongst the upper echelons of the Pulitzer Prize winning authors work. Not here will one find quite the literary majesty of Blood Meridian, or the poetic beauty of his Border trilogy. No Country For Old Men is, as far as can be said of such a writer, a far more pulpy effort. When reading, one cannot help but feel that the author’s main objective was to produce a tale that would be easily converted to the screen. So it should come as no surprise that just two years after the novels publication, No Country For Old Men has been brought to life on cinema screens by the unquestionable genius of Joel and Ethan Coen. To begin, the Coens seemed to have realised something that so few filmmakers who adapt books seem to, and that is that cinema is a medium of images. This is an art form not constructed upon language or on sound, but upon the visual, upon what is seen on the screen. A medium where the perfected art of editing can create more tension than any combination of musical instruments could combine to do in the sort of terrifying score that instructs its audience to be afraid. Here are a couple of filmmakers content to show you and let you see for yourself, just how terrified you are going to be. Cinematographer Roger Deakins (collaborator on every Coens film going back to 1991’s Palme D’Or winning Barton Fink) photographs this stark and horrifying terrain with the bleak and terrifying stillness it requires, each frame set up to perfection, each shot telling its own story. The Coens have adapte d their screenplay as should be done, the pondering voiceovers that fill out and dominate the novel have been largely done away with. The screenplay is filled with silence, plenty is going on upon the screen but not a great deal is being said. This is one of the finer adapted screenplays of recent times, and others should take note; it stays true to it’s source novel while at the same time understanding and grasping the benefits of its own medium. Having done away with any semblance of a score, the Coens use of sound in the film is perhaps the most notable of any motion picture in a good while. The sound IS the score, and how effective it is; the blowing of the wind, the shot of a gun, a flowing river, a speeding car, a ringing telephone, or the approaching sound of a killers footsteps. Each noise is amplified, again, no score is going to help the viewer along, it’s the sounds of the world that soundtrack this film and it is all the more unique for it. Moving forward again, one cannot complete a review of this gem of a movie without a nod to it’s award winning ensemble cast. Josh Brolin is the closest thing our story has to a hero, yet a hero he is not. His Llewelyn Moss is basically a down on his luck loser with a heart of…well…not quite gold. Brolin inhabits his character with a simple yet strong, naive yet knowledgeable air. Our boy might not be the sharpest knife in the drawer, but he knows how to get by. Lord knows where this man his risen from, but let’s hope he stays. Kelly McDonald’s ever loyal, ever loving and ever adorable trailer trash wife is the human soul of this movie; she is the audience surrogate, looking in on this world of depravity with no comprehension of its workings. Her final scene is as heartbreaking a piece of work as you are likely to see all year; she sits comfortably and without fuss on the sidelines throughout the entire film and when the time comes for her to step up to the plate, she does so…and smacks it out of the park. Woody Harrelson turns in fine supporting work as the bounty hunter with the knowing smirk, the only one who seems to know what is going on and the one who thinks he can comfortably control it, it’s yet another sign of the Cheers graduate’s ever rising status as an incredibly capable supporting player and hopefully shall lead to bigger and brighter things in the future. Tommy Lee Jones is our heart, he’s our conscience, he whose melancholy, world weary tones bring us in, and take us out of this world. 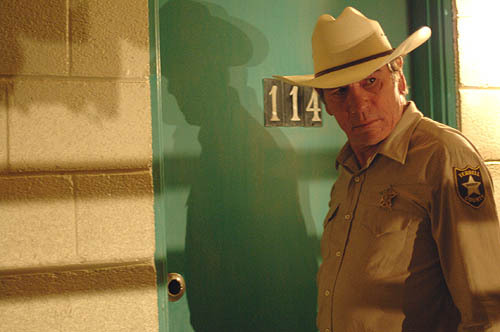 His disillusioned, lost and confused lawman is as perfect a performance as ever he has given. The Oscar winner is by all accounts a McCarthy nut and it shows on screen here as you feel every twitch, every stare, every word rise up from deep within him, with nothing but truth pervading throughout. Yet looming large over this world of shady dealings, good women, troubled men and those just trying to do right, a dark cloud hangs. A towering statue of evil, d ecked out in black with a bad haircut and a can of compressed air. Javier Bardem has been nominated for an Academy Award, he has been robbed of an Academy Award and finally it seems that at long last his time has come, this is the one that will make him, and you simply can’t stop what’s coming. The fearsome Anton Chigurh is at first glance nothing more than a retread of the Terminator, yet you see it on his face from time to time, humanity shining through. Here is that rarest of things, a subtle waltz through human insanity. Oscar is calling, and Anton is coming. All in all, none but the foolish could deny that the brothers Coen have risen back to the level they belong. Having spent the last 6 years toiling in mediocrity, they stand back up and put on display for all the world, a perfect demonstration of just why they are among the finest filmmakers to have ever stepped foot in the game. They are craftsmen of the highest order, and while that style drips from every frame of their work, the humanity is never missing, your heart never fails to race, never fails to break. Here we have a commentary on the state of a nation like no little man in a suit could ever give, here we have pitch black humour, edge of the seat thrills, philosophizing and visual poetry. Here in lies a profoundly American story, one that manages that rare feat of improving upon its source material, what more could a person ask for?